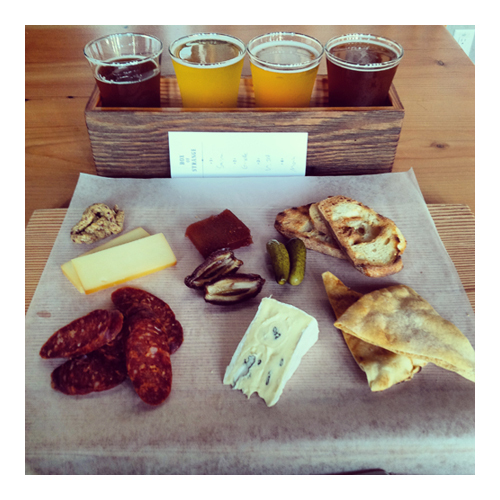 Taster Tray Series – Strange Fellows Brewing: Today’s feature is Strange Fellows Brewing which is located in East Vancouver, BC – an area we like to refer to as the Yeast Van district since it’s home to a host of great breweries like this one. This place is one of the more celebrated new breweries in BC, a brewery that people were raving about so I managed to sneak in a visit after trying out a couple other breweries in the area. The beer line up seems to rotate quite frequently, so you can always expect a little variety with every visit and of course a few mainstay beers like Talisman Pale Ale will always be on tap. Strange Fellows Brewing: The head brewer Iain Hill has been in the Vancouver brewing game for a while, a former Mark James Group Yaletown and Red Truck Beer brewer, he opened up his own place with business partner Aaron. Located along Clarke Drive and being within a short walking distance from the Skytrain, this unique brewery features a decent sized tasting room and about 6 or 7 different beers on tap on any given day. They also sell canned product on site and have a super awesome charcuterie board that they’ll put together for you on demand. Going with the theme of strange, they’ll often feature odd and unusual events like Spanish Fiesta Week, some unusual artwork in their art room and other odds and ends that you need to be there to experience like the backwards lettering on the bar menu. The Taster Tray / Flights: Actually dubbed a “Box of Strange”, their taster tray cost $7 for four sampler glasses of any beer on the menu. I didn’t catch the size, but I’d guess about 5oz per sample. It is served in its very own box with a labelled card to help you navigate the beers, a nice touch for those who can be forgetful like me. Each glass was clean, filled correctly and served at a reasonable drinking temperature; all things I admire and appreciate as beer geek. I thought the value for money was good, you can also buy individual taster sized drinks for $2 each but they give a slight break on the full tray price at $7 for four. I’ve paid anywhere from $4 to $10 for a taster tray in town, this is right down the middle of the pack in terms of cost. A nice 10 spot does the trick when you factor in a small tip and tax. The Beers: As shown in the title picture, from left to right I sampled the Barnyard Saison, the Canary Sour Grisette, the Guardian White IPA and the Crafty Monk Abbey Ale. All beers were decent, but the White IPA was a big hit for me (and great with the spicy sausage) and the Barnyard Saison was excellent too, especially when paired with some of the Cambozola cheese from my charcuterie plate. The Grisette was nice and oddly went well with dill pickles and finally the Crafty Monk didn’t really do it for me, even when paired with some dates and cheese. I wasn’t a bad beer, just overshadowed by the rest of the great ones. Final Impression: The charcuterie board was fantastic and the beer was pretty great too, so if you are in the area and want something a little extra, than this is the place to be. They have a decent barrel setup, a foudre, a passion for the weird and some creativity in design and brewing, so I expect even more great things from this place in the future. Keep in touch with their Facebook Page to stay tuned with whatever they dream up next, they are worth a follow if only to see what’s going on. Let’s face it, they had me at beer and cheese anyway, as soon as I ordered this I knew I’d come back again! Excellent review. One of my fave places. Cheers, I’ve been impressed so far!